The Internet is the most remarkable thing human beings have built since the Pyramids. 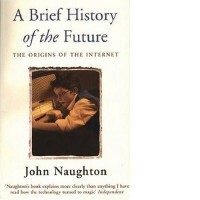 John Naughton’s book intersperses wonderful personal stories with an authoritative account of where the Net actually came from, who invented it and why, and where it might be taking us. Most of us have no idea of how the Internet works or who created it. Even fewer have any idea of what it means for society and the future. In a cynical age, John Naughton has not lost his capacity for wonder. He examines the nature of his own enthusiasm for technology and traces its roots in his lonely childhood and in his relationship with his father. A Brief History of the Future is an intensely personal celebration of vision and altruism, ingenuity and determination and above all, of the power of ideas, passionately felt, to change the world.